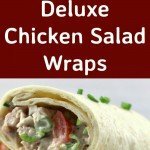 Deluxe Chicken Salad Wraps. These little wraps are great for parties, lunches, suppers, or any time! It's a great way to use up left over chicken or turkey, and the recipe is nice and easy, with no fuss. Delicious! Deluxe Chicken & Bacon Salad Wraps. These little wraps are great for parties, lunches, suppers, or any time! It’s a great way to use up left over chicken (or turkey), and the recipe is nice and easy, with no fuss. Delicious! Deluxe Chicken Salad Wraps. Oh boy! These are so delicious. 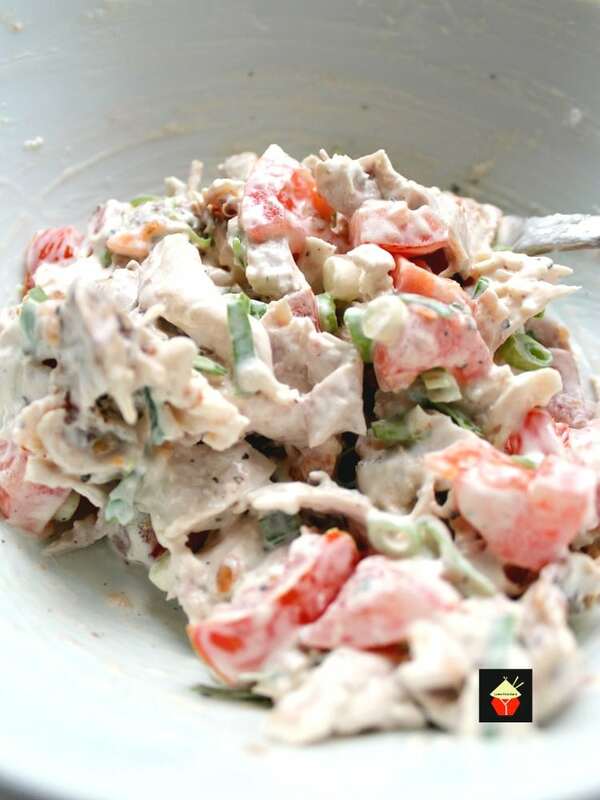 The filling is made up of leftover roast chicken, creamy mayonnaise and herbed cream cheese and a good measure of crispy salad items. Oh… and let’s not forget the sneaky chopped bacon thrown in for extra measure! 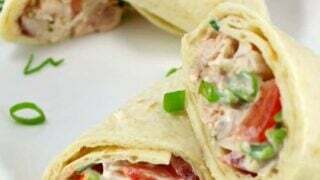 These deluxe chicken salad wraps are incredibly easy to make and would be perfect for party food, game days, lunches and so on. You can make these ahead, either entirely, or just make up the filling and refrigerate until you’re ready for serving. They don’t take long at all to assemble. You can cut them into small pieces if serving for a party, or simply cut each wrap in half and have yourself for lunch! For the ingredients, feel free to ‘eyeball’ the measures to suit how you want the filling to taste. 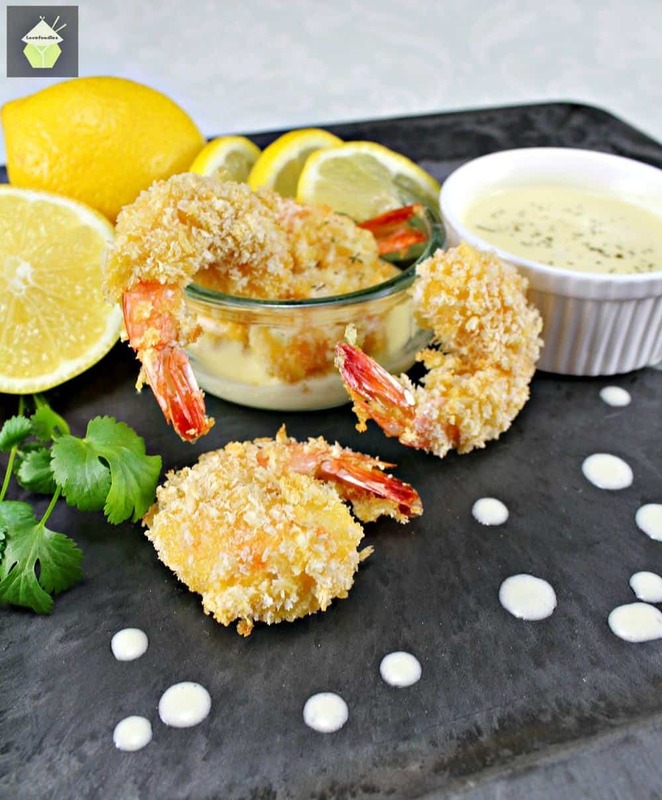 You do need the creaminess of the mayonnaise and cream cheese to act as a binder for the filling, so make sure you add enough so it will all hold together. 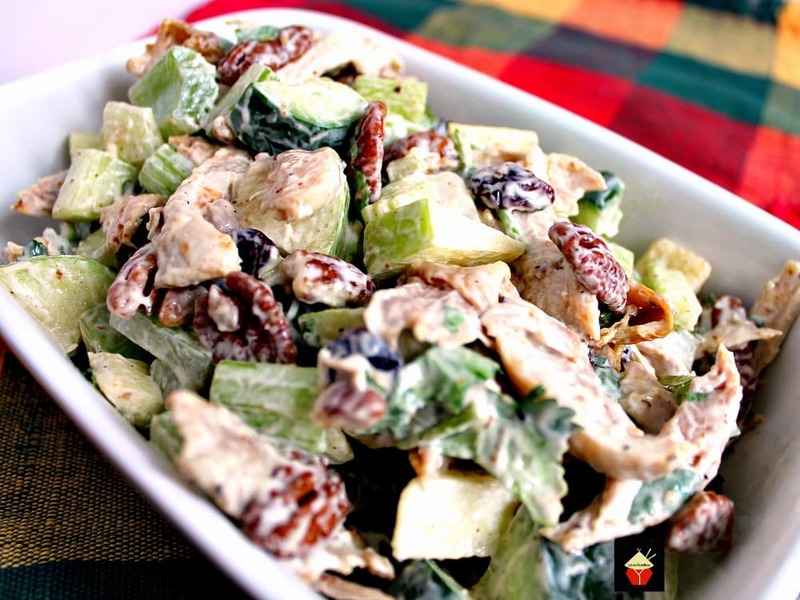 Use whatever salad items you like the most. You could make up a variety of wraps if serving for a party, perhaps some chicken or turkey ones, and some salmon ones. Really, this recipe is as flexible as your imagination will allow! As for the chicken, I’ve used leftover roast chicken, but you can use rotisserie chicken, or indeed turkey from your leftover Thanksgiving or Christmas meal. 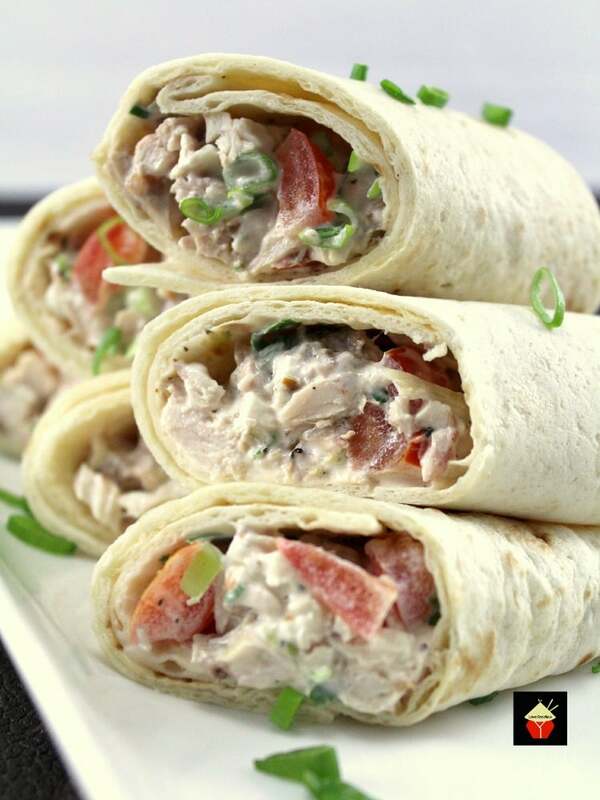 So feel free to play around with the flavors and enjoy our deluxe chicken salad wraps! 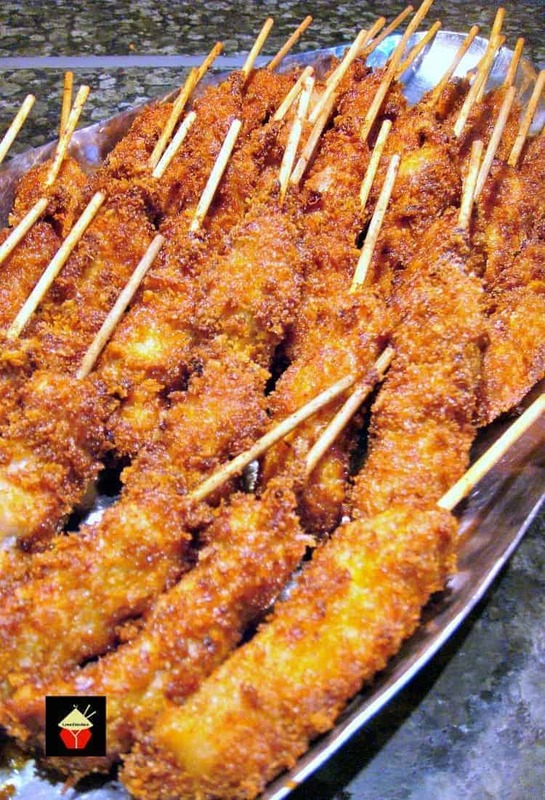 Be sure to check out our other party food recipes too! 2 – 3 Tortilla Wraps. 1. Place the chicken in a mixing bowl. use your hands to break into small bite sized pieces. 2. Add the remaining ingredients and combine. Taste then add salt and pepper to your liking. 3. 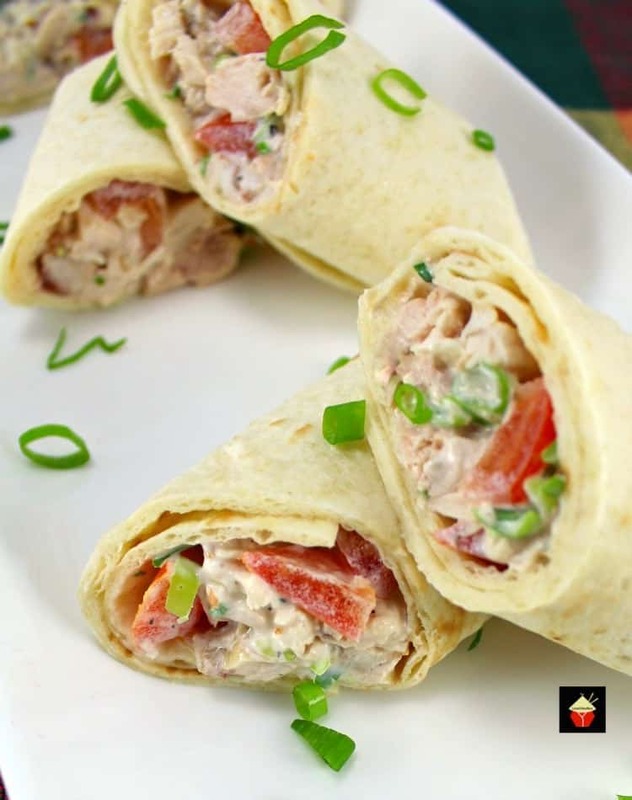 Place a tortilla wrap on a plate and spread some of the chicken filling along the wrap and simply roll. Roll as tight as possible to avoid the filling becoming loose. 4. Slice in to small pieces and arrange on a plate, seam side down. 5. For best results, cover in pastic wrap and refrigerate for at least 30 minutes to allow the filling to firm up a little. This is very flexible, so feel free to add sweetcorn, red onion, pickles and so on. Depending on your budget and what you have to hand, you may want to bulk the wraps out with more salad items than chicken. It’s up to you! 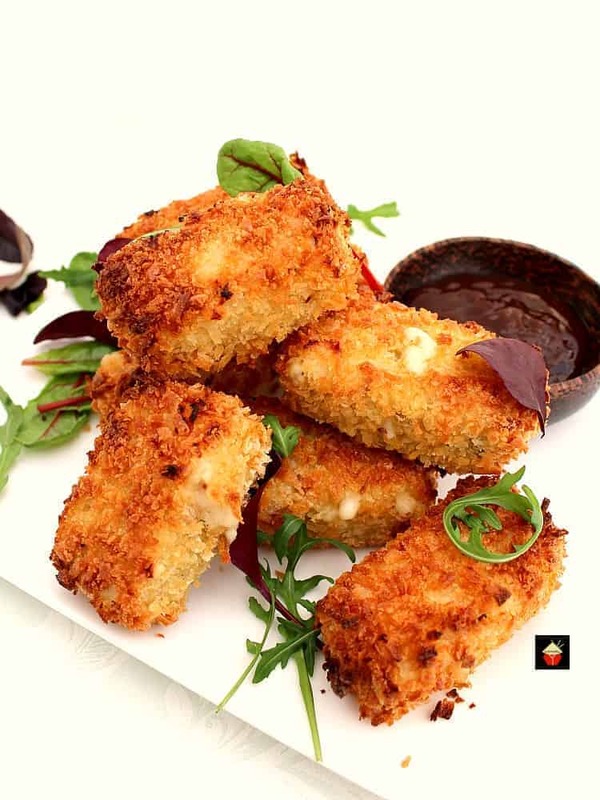 Here’s a few more of our delicious party food recipes for you to enjoy! Deluxe Chicken and Bacon Salad Wraps. These little wraps are great for parties, lunches, suppers, or any time! It's a great way to use up left over chicken (or turkey), and the recipe is nice and easy, with no fuss. Delicious! 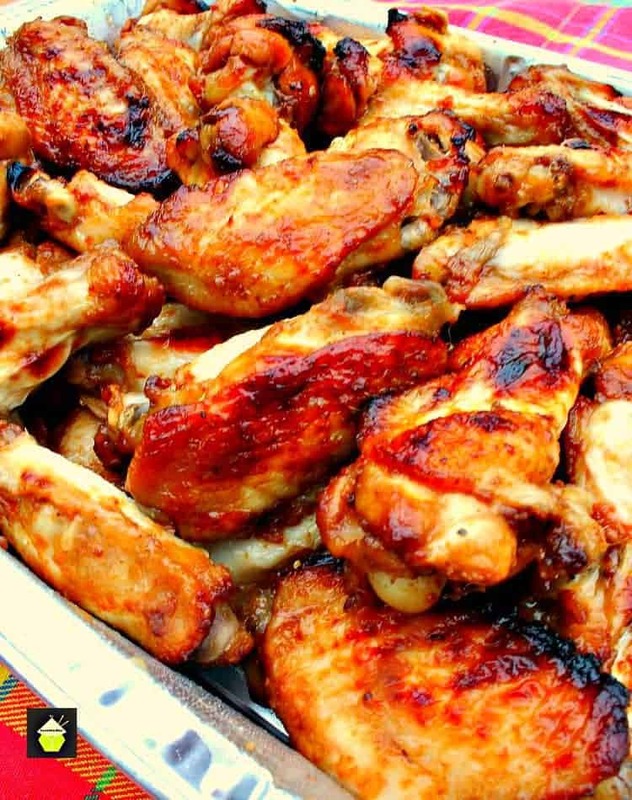 Place the chicken in a mixing bowl. use your hands to break in to small bite sized pieces. Add the remaining ingredients and combine. Taste then add salt and pepper to your liking. 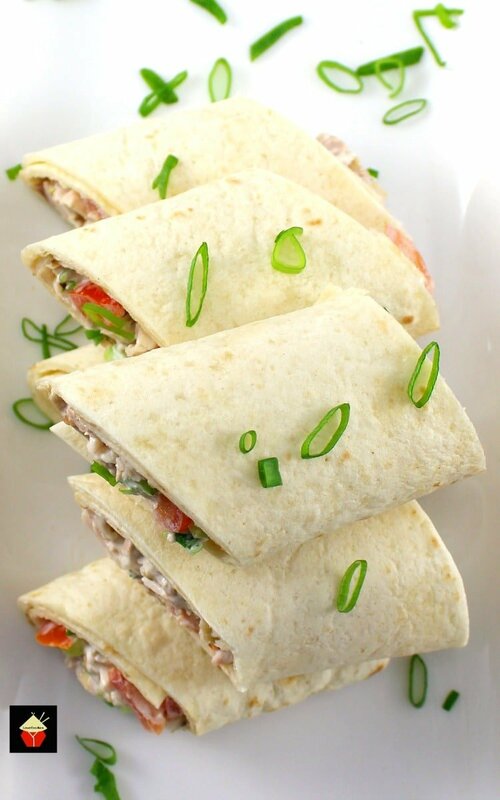 Place a tortilla wrap on a plate and spread some of the chicken filling along the wrap and simply roll. Roll as tight as possible to avoid the filling becoming loose. 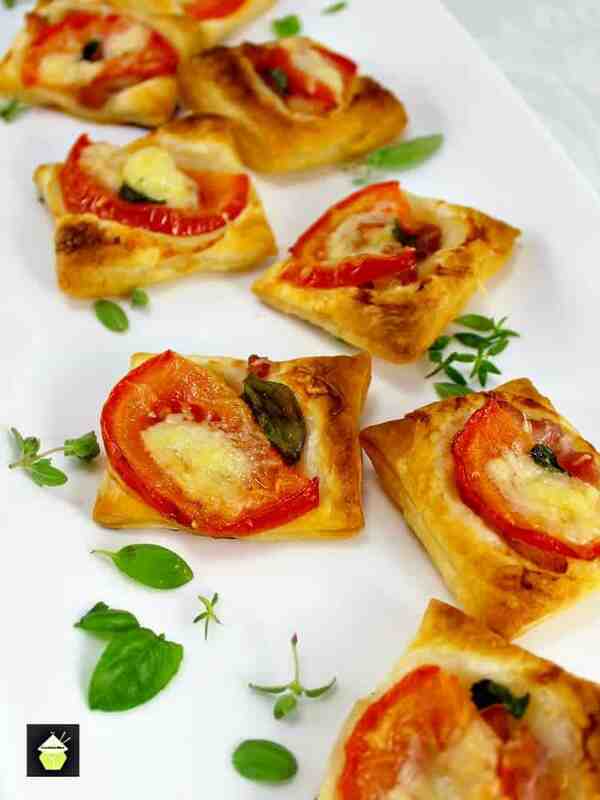 Slice in to small pieces and arrange on a plate, seam side down. For best results, cover in plastic wrap and refrigerate for at least 30 minutes to allow the filling to firm up a little. This is very flexible, so feel free to add sweetcorn, red onion, pickles and so on. Depending on your budget and what you have to hand, you may want to bulk the wraps out with more salad items than chicken. It's up to you!